Why am I am using an ArtBin Super Satchel to store my alcohol markers? I have had my alcohol markers for over a year now, but was struggling to find a way to store them effectively. Alcohol markers are not cheap pens, so storing them safely is essential. Some brands recommend storing them horizontally, which makes choosing a good storage system even more complicated. I have too many to keep in a pencil case. It is important to be able to see them easily to choose colours for colouring. And the more markers I get.. the worse the problem becomes. economical – let’s be honest, as cheap as possible! So to start with I tried storing my pens in an old grocery box (see picture below). I cut strips of cardboard which laid between the rows of pens so that I could pull one out without them all falling down into the gap. This meant I could keep the colour families together, which was important. Well that was the theory, anyway. This system worked ok for a while, but was very, very flawed. Obviously it was super economical, however I regularly knocked it and all the pens fell out (which is VERY annoying once you get more than 30 pens or so!). I could carry it about easily, but it was scruffy looking and I would have been ashamed for anyone else to see it! Eventually, after picking up all the pens and resorting them for the umpteenth time.. I had had enough! I spent a lot of time looking online for storage solutions, and found some amazing ones! Many resourceful people have made great marker pen storage units from foam board, MDF and even old pipes. There was some ideas I really liked, but I really did want a portable solution, and rather did not want to have to build something too sophisticated myself. , designed to hold the pens in individual slots. These shelves can hold different brands of pens too. Whilst these trays would be great for use in my craft room, they would not be transportable which was something I really wanted. Were I going to leave my pens in one place all the time, I would have gone for this option.
. This was only £25 on Amazon, which seemed very reasonable when it holds up to 380 pens! It is portable, and very smart. However it stores the pens upright, which might have caused issues for my Speccy Noirs, and the reviews for the product indicated that unless you fill the storage bags pretty full, they just tip over all the time. And I don’t have 380 pens. When this blog post was first written I had 120 Spectrum Noirs and 37 Letraset Promarkers. My storage baskets would not be very full. The ArtBin Super Satchel solution! Eventually I decided to go with the ArtBin Super Satchel hard case, with their Marker Pen dividers inside to keep the pens separate.
. It is a large, sturdy, clear plastic box with two catches to close it and a matching handle. The box comes with an assortment of internal dividers to allow you to section the interior up how you wish. The box seems very strong, like all ArtBin products. The catches clip properly and it all feels very sturdy and reliable. The plastic is transparent so you can see the contents clearly with the lid closed.
. These easily clip inside the Satchel to hold the pens in individual compartments. Each tray says it holds “up to 64 markers”. In each tray four of the marker holes are seriously reduced in size because of the clips to hold the tray into the Satchel. This means that these four holes can not be used for the Spectum Noirs or Promarkers, Copic Sketches and other standard sized markers, however the Copic Ciaos and Multiliners do fit in the small holes (see photo at bottom of page). I can not deny that this is annoying and does break up the rows of pens. You can see the four compromised holders in this image. Whilst this size of Satchel holds four trays in total, it is not necessary to use all four. One could have just a couple of trays and then use the dividers in the remaining areas for storage. The trays are purchased individually so you could buy them as required. There is also a smaller sized ArtBin Satchel which takes two trays. The other very annoying problem is that the base of the Satchel has raised groves on it, where the optional dividers would slot. These grooves cause some rows of the marker pens to poke up a bit above the others. This is very noticeable with the Spectrum Noirs and means that the lid doesn’t quite close flush all around. It does close, safely, but there is a wee bit of bowing visible. The Promarkers are shorter than the Speccys and whilst they are still uneven over the grooves, it is not as noticeable and does not affect the lid. You can see how the Dark Red pens are noticeably higher than the rest in this photo. I think I may add a bit of clear tape over the top of the tray clips to ensure they stay in place. A couple of times I have grabbed at a pen and it has pulled the tray up with it. Because the trays are very loosely fitted they move easily. This is a minor annoyance, really, and once you have had it happen once or twice you know about it and just take more care pulling out pens. I like that I can sort my pens out as I wish, and their individual holders means they stay put. It is now much easier to find the colours I want when working. 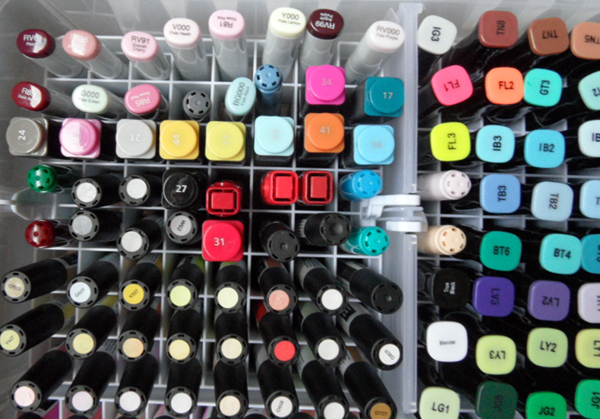 I store my ArtBin Super Satchel in a vertical position, so the pens are horizontal. It can also be used in a vertical position if you stand it on the handle side, so the lid can open upwards. It will stay open as it falls back a little. I mostly colour when sitting on the sofa. Then it is great to just lay the open Artbin on the sofa next to me, perfect. Another advantage is that, when not in use, it can tuck out of the way. An open shelf system would need to be out on my desk all the time. The ArtBin only needs to be out when required, and as it is sturdy and has a lid, can go elsewhere when I don’t need it. As someone who has a very tiny studio/craft room, this is a big plus! The handle seems very strong and I would be confident taking my pens to crafting classes or groups in this sturdy case. All in all I am pleased with my final decision to go with the ArtBin Satchel. The unusable gaps between the trays etc do annoy me a little, but I did know about them in advance from reading reviews. They do not stop this from being a sturdy and attractive storage solution that ticked all my requirements. I paid £16.50 for the ArtBin Super Satchel and £20 for the four trays. So the total cost was £36.50. There is still quite a bit of room in the Satchel for more pens. I don’t have the full Spectrum Noir range yet, and would definitely like some more Promarkers. I would also like to eventually get some Copics to try (they are pretty hard to find in the UK, and even more expensive than in the USA). At the moment I use the spare bit of space to store some stamped images I am working on. Since purchasing this storage satchel I have added some more brands of markers to my collection, including Copic Sketch and Ciaos. Click the brand names to go to the reviews I have written on some of these pens. The lovely new alcohol markers from AlteNew are taller than any of the above brands. The popular Tombow ABT Dual Brush water-based markers are even taller. They therefore do not fit in the ArtBin. These are now in my Togood Marker Pen Storage Tote instead. I will continue to update this article as and when I get other brands of alcohol markers in the future. If you know of other brands that fit, please let me know and I will add them to the list. Update 30 January 2019 – as my marker collection has continued to grow, I now have yet another storage case. Check out my review of the lovely Togood Marker Pen Storage Tote here. It fits all sizes of markers! Here are links to the Artbin Super Satchel and accessories on Amazon. If you click these links and purchase from Amazon I will receive a small commission for having sent custom their way. At no extra cost to yourself. Thank you.